George H. Schroeder retired from Crown Zellerbach as Chief Forester in 1975. He had worked in the woods from the time he was 14, doing just about every task and job required to move trees from the stump to the mill. He greased skids for oxen teams, climbed spar poles to set the heavy cables, felled huge trees with an axe and a misery whip and wrestled his peers to make extra pay. With his wife, Clara E. O'Neil, and kids, he began to accumulate timber land starting in 1949. 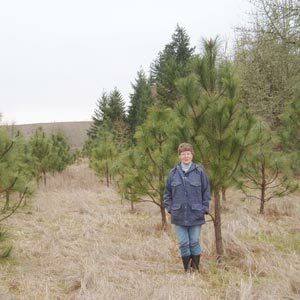 Presently, there are approximately 300 acres in 4 Oregon counties managed by S&O. Our goal is to have forests in the family forever, producing income from timber harvests, firewood, alternative medicines, mushrooms and truffles, and other products not yet researched. The peace, quiet, beauty and esthetic value of the lands will provide unlimited opportunities for friends and family for many years to come. Hard work and an eye to the future represent the legacy of George and Clara.